Let’s address these issues first and then we’ll move on to why you need to stretch and how you should be stretching before sailing. 1. Why Do I Need To Stretch Before I go Sailing? The easy answer to this question is to ask another- have you ever come back from sailing sore? Or are you sore the next day? If you answered yes, then your answer to the first question is a YES! If you haven’t sailed before, or if it’s been a long time since you have, or a long since your last workout then it might be a good idea to do some quick stretches before you jump on the boat and when you come home. 2. 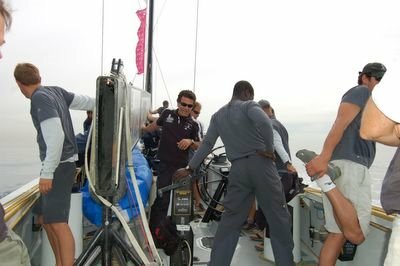 Is Sailing A Physically Demanding Activity? Yes and No. It all depends on what kind of sailing you are doing. What boat will you be sailing on? What is your job when your sailing? Are you the skipper at the helm? Are you the sewer man getting sailing in and out, up and down? Or are you somewhere in between, running lines, tightening and hoisting sails? Is it a light wind-out for a sunset cruise or you venturing out for a 2-3 day race? 3. How Should I Stretch Before Sailing? Focus on the Muscles That Need the Most Help. Generally speaking, when you are sailing, you will be pulling on lines which will involve several different arm and back muscles. You will also be using your hamstrings to anchor you as the boat is heeling. If it’s a windy day, then you’ll probably be moving often to different sides of the boat. In the middle of changing sides and positions on the boat you will also be ducking under the boom. Why Go Sailing In The BVI?